Female idols of less-known girlgroup struggle more with public promotion. In order to become well-known, they must become an internet viral icon like Cheng Xiao (Cosmic Girls) or shine through dramas or hot reality shows like how Jung Chae Yeon (DIA) and Kim Se Jeong (Gugudan) did during Produce 101. There are many female idols of less known girlgroups own themselves an excellent appearance which can be compared to idols from the Big 3 agencies, but they still haven’t gotten the attention yet. Many thinks that if these girls are scouted by big agencies, their names wouldn’t be less than those from BLACK PINK, TWICE or Red Velvet now. Hana’s appearance can easily stun anyone right at first sight. This female idol became the center of attention a few times before thanks to her ethereal beauty but in order to become a household name, Hana still need more luck and impact in her singing career. She dreamed of being an idol ever since she was a child. Before her official debut, she had appeared in some MVs of VIXX andSeo In Gook. In 2014, Hana also acted in the drama “High School King Of Savvy”. 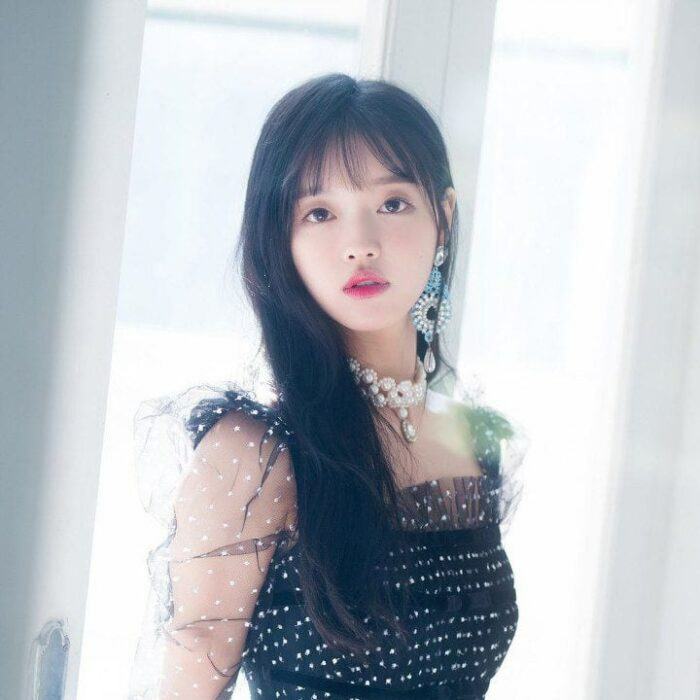 YooA’s beauty is out of this world with a doll-like vibe. Beside her impressive look, the female idol owns herself a pair of long legs even though she is just 160cm. Just like Hana, YooA has became the center of attention a few times before. She is perfectly capable of doing any kind of concept that her group is following. Aside from her singing career, fans hope that her agency will give her more chance in the acting field. Naeun used to be a trainee of JYP, but unfortunately, she left the agency before “SIXTEEN” – a survival show from which TWICE is formed – began. Thanks to her time at JYP, Naeun became close with Chaeyoung, Tzuyu and Nayeon of TWICE. With her goddess look, if she had participated in “SIXTEEN” and debut with TWICE, she would have become one of the hottest names of K-Pop right now. Lee Sae Rom has act in many MVs and movies ever since she was a child. This born-in-1997 idol was also known as a model. Many netizens call her little Han Chae Young. Lee Sae Rom is one of the worth noticed members of the survival show “Idol School” – the show in which fromis_9 was formed. The show wasn’t as successful as expected and fromis_9 is still struggling to prove themselves among many other K-Pop girlgroups. Lovelyz is full of impressive beauties but they still haven’t made it big yet. It’s hard to choose who is the prettiest among them. Among 8 girls, Jiae’s appearance is said to be like a fairy. Before her official debut with Lovelyz, she debut as a solo artist. In 2010, Jiae played a small role in the drama “God of Study”. She was once a guest on the high-rating show “Running Man” in 2012. In Lovelyz, Yein is the member with the most male fans. Even though she is the hosttest name in her group, Yein still cannot become an household name. The female artist once challenged herself as a model during her high school year. What’s worth noticing is that she was a JYP trainee before moving to Woolim in 2014. LOONA is a group with very interesting debut system where one member will be introduced each month. Heejin is the first girl to debut. Thanks to her bright and angelic look, she received quite the attention. Heejin has appeared in some CF before and one of the CFs even went viral with millions views in just 1 month. However, Heejin still need more luck in her career. Knowing this, Heejin the survival show “MIXNINE” in the end of 2017. She received a high ranking among all the female contestants but the producer decided to let the male winners debut instead of them. Bona’s perfect appearance is a mix of innocence and sexiness. Before going to Starship, she was a trainee at CUBE. This is why she is quite close with the BTOB members. Aside from her singing career, Bona is actively challenge herself in the acting field. ‘Til now, she has appeared in 3 dramas. Fans are hoping for Cosmic Girls to have their first big hit and Bona herself to have a milestone in acting.